Edwin Chappell employed 2 assistants in his business and the family also had a domestic servant, Jane Barnes. Arthur married his wife Edith Frances, nee Jordan, in September 1907. In the 1911 census the couple were living at 67 Castle Road, New Sarum, Salisbury. Arthur was working as a commercial traveller in the provision trade. At some point after this date the couple moved to 132 Avenue Road, Southampton. Their daughter Phyllis was born in Salisbury in December 1915. Arthur enlisted in Devizes and served as a Private in the 5th Battalion of the Hampshire Regiment. The battalion was formed in Southampton in March 1915 as a “third line” unit and moved to Bournemouth later in 1915. In early 1916 it was renamed 5th Reserve Bn and in September 1916 was amalgamated with the 2/6th, 7th Reserve and 3/9th Battalions. In June 1917 it was absorbed by the 4th Reserve Bn. Arthur subsequently served in the 6th Company of the Army Ordnance Corps. 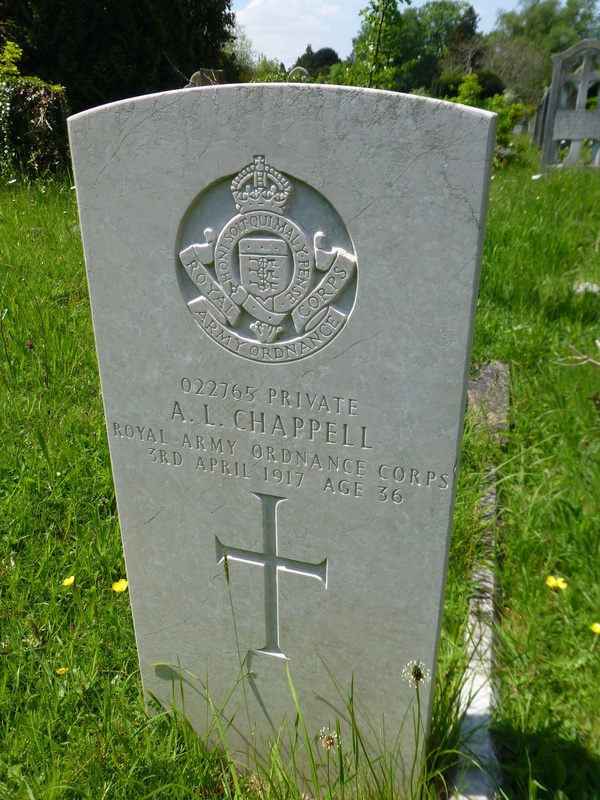 It has not been possible to trace Arthur’s service records and it has proved difficult to filter information regarding the Army Ordnance Corps as they served in so many places. Arthur died at home in Southampton on 3rd April 1917 after suffering from cerebro spinal meningitis. He is buried in Southampton Old Cemetery. Grave reference 176 C 270. This cemetery, on the Common, belongs to the Corporation. It was made in 1846 under Act of Parliament and it now covers 27 acres. It contains 99 scattered Commonwealth war graves of the 1914-18 War, a plot of 21 1914-18 War Belgians and 15 Commonwealth war graves of the 1939-45 War.